I just had to share this sweet chocolate animation with you guys! I know that missing piece puzzle was recycled so many times by now, but I’m sure you’ll admit it’s fun to see something so simple yet so amazing. If I were a food company, I’d apply this principle immediately to generate some extra profit! What do you say? I can’t seem to pinpoint the answer, yet I’m perfectly aware you can’t generate matter out of nothing! The pinpointing is just that there is graphic slight of hand. That piece that moves from the lower left to upper right does not actually fit as shown. When it ‘snaps’ into place, it is a different sized piece. Same for the upper right piece that goes lower left. **Snap**, different sized piece. Exactly. This one really stumped me for almost a month last year though, I ended up drawing it out on graph paper and working it out with my math teacher haha. What a great illusion. John’s right. I knew this trick before seeing all the missing puzzle piece or changing area illusions, so I didn’t find them as interesting as others. Yep. One way to easily see how this couldn’t actually happen is if you look at the bottom left corners of the two angled chunks of chocolate- you can see the size of the little triangle pieces you could break off is obviously different. (The one that comes of the left side is smaller). Since those little triangular corners replace each other when the chunks are swapped- they would need to be the same size. Instead- the smaller one grows as it snaps in place. I noticed that *snap* too. Thanks for saving me the time and nickel for graph paper. About the “being first btw” WHO CARES!!!!! Ummm… I care, Craig. I’m a field agent with the National First Posters Society. It’s my job to care. And no big deal, Anonymous… thinking you were the first poster only to find out you were beat happens all the time. By the way- we wouldn’t have been able to credit you with a first post anyway without knowing who you are. Animator is simply growing the pieces as they are mated. So this is how you get infinite chocolate…. It is not really that amazing when you consider it is not a real optical illusion, just changing the size of one of the pieces. It’s an illusion. When the trick is done on the ACTUAL mathematical cut lines and rearranged, there is actually space missing when reformed and that space is equal to one square. The pieces do NOT reform perfectly, like it appears. Remember, it’s an ILLUSION. So, if the above were to take place in reality, the chocolate bar would get smaller and smaller with every slice and rearrangement. Make sense? will that work on a real candy bar? cut it out of cardboard and check it for your self it works it does not seem to be a an illusion. So you solved the worlds energy problem. If you focus and center the image entirely on the largest of the pieces broken off the main body during the animation, it’s a lot easier to see it “gain mass”, equivalent to one block. It’s not very obvious in this one because it doesn’t center on this piece I mentioned, but you can see it if you concentrate on it. I also see the discrepancy of this image when it moves. In using a motion program with a smooth movement like this, the images will warp to line up with the other objects it is piecing to. I do not qualify this as an illusion, but if someone can make this illusion work I think it would be cool. But I’m pretty sure there’s something in science that will not make an illusion like this work. The initial cut shows there are a few angled pieces that would comprise a complete square if this were an actual chocolate bar. As John mentioned, the graphic makes these pieces disappear when it snaps into place. Probably done using simple flash animation, the left piece which moves right gets slightly bigger to fit, but the growth is gradual and the human eye barely registers it as it focuses on the other moving pieces. There’s a mathematical solution. The pieces seem to fit, but are off just ever so slightly. It has to do with right triangles. If you add the area of the right triangles created by the diagonal edges up, you’ll see that they actually differ by one- which accounts for the missing 1×1 sized piece. There is a little optical deception occurring here, because the pieces won’t fit together quite the same as they did before. In physical demonstrations, you can definitely see the extra area of the one missing piece created distributed around the chocolate bar. Correcto. the easiest way to see that is to focus on the lower angled edge of the bigger left piece. As it shifts up and over, the bottom edge grows quite noticeably. That’s the fakery here. We did an exercise on this in math, it has to do with Fibonacci numbers. Thank you for posting that! I just couldn’t see the answer before. Much appreciated. Does this mean I cant have an infinity amout of chocolate? Nice! This works like the antique vanishing ladies illusion and exactly like its explanation. (Perhaps someone could repost that graphic with the sliding rectangles.) All it would take is reducing the area of each chocolate rectangle by 1/25 of sq. unit. The bar left over is ever so slightly SMALLER overall but still has the same NUMBER pieces which is what ‘sells’ the illusion. It is not just one piece that shrinks. It has to be a bunch of them. Bravo to the creator! 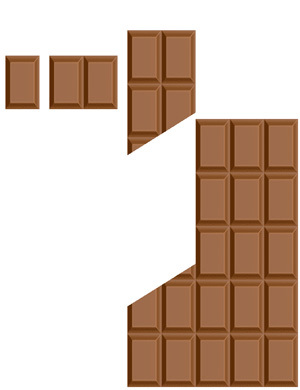 The larger piece of cutted chocolate grows when it moves sideways. Sleight of hand, not slight of hand. This is not an illusion, it is a cheap trick. Added to http://www.squidoo.com/optical-illusions2 great stuff! What about with a 6×4 grid, will the effect still be the same? I did this with a sheet of paper. It’s real!! !